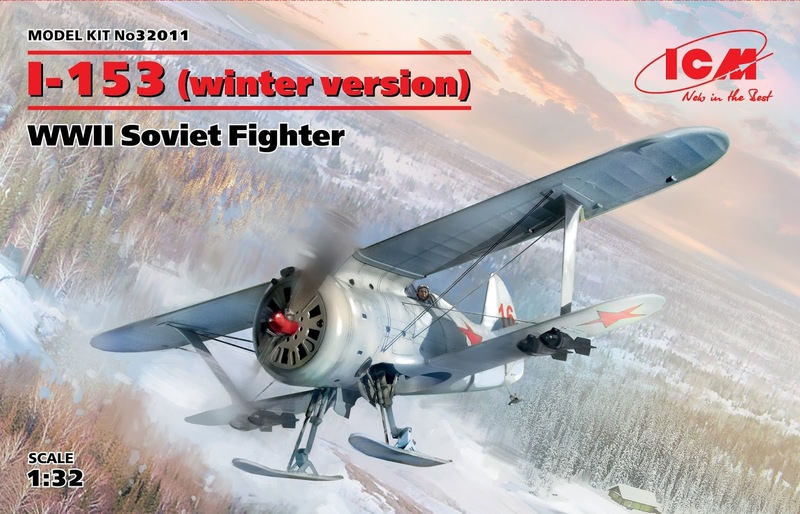 The Polikarpov I-153 was the last of Nikolai Polikarpov's biplane fighter aircraft to enter service, and despite being the most advanced entry in the series was already obsolete by the time it entered service in 1939. The prototype aircraft (note a few of these pictures will include aircraft with wheels as well as skis). Work on the I-153 was officially approved on 11 October 1937. 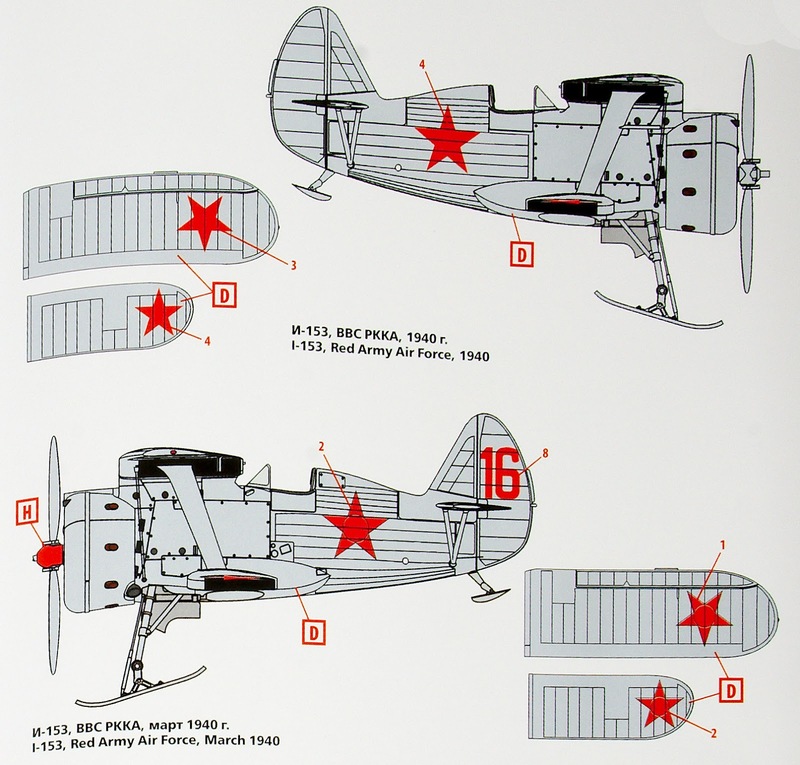 Polikarpov's main aim was to reduce drag and weight in an attempt to compensate for the weight of a heavier engine. He did this in two main ways - first by introducing a retractable undercarriage, and second by returning to the 'gull wing' configuration of the I-15, in which the upper wing was linked to the fuselage by diagonal sections, eliminating its central section. This had worked on the I-15, but had been unpopular with some pilots and higher authorities, and had been removed from the I-152. 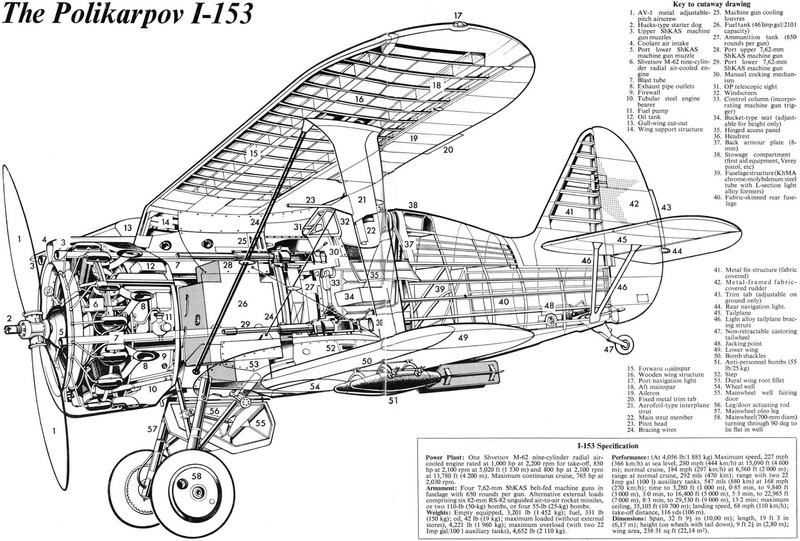 The fuselage and wings of the I-153 were similar to those of the I-15 and I-152, with a steel tube framework, covered by metal at the front of the fuselage and fabric elsewhere. The first prototype's maiden flight is variously reported as having taken place in May or August 1938, with A.I. Zhukov at the controls. In June-August 1939 state acceptance trials were conducted using an I-153 powered by the new Shvetsov M-62 engine, a version of the M-25V with a two-stage supercharger. Also used was a version powered by the 900hp M-63 engine, and this version passed its trials on 30 September 1939. Only a handful of aircraft were produced with the M-25 engine. 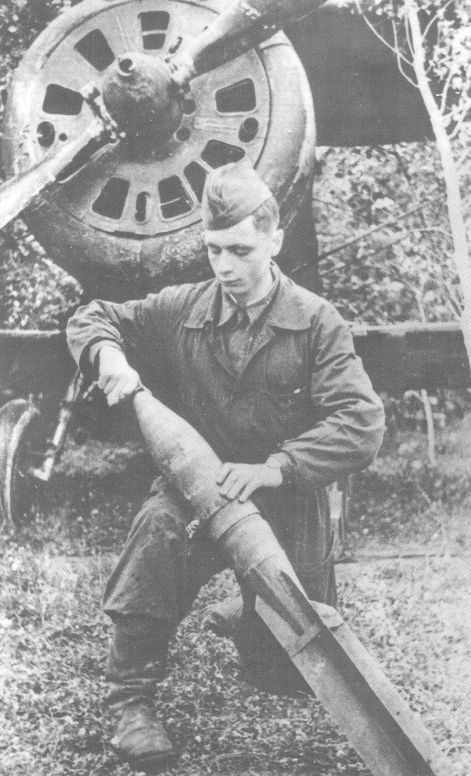 The 800hp M-62 was used in the largest number of aircraft, around 3,018 in total. The 1,100hp (at take-off) M-63 was used in 409 aircraft. A total of 3,437 I-153s were produced, beginning in 1938. 1,011 aircraft had been completed by the end of 1939, and a massive 2,362 were built in 1940, at a time when the Soviet Union desperately needed more modern monoplanes. 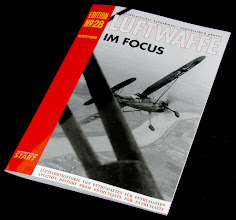 Production came to an end early in 1941 and only 64 aircraft were completed that year. 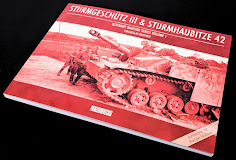 The standard I-153 was armed with four ShKAS machine guns with a rate of fire of 1,800 rounds per minute. The four under wing bomb racks could carry up to 441lb of bombs. 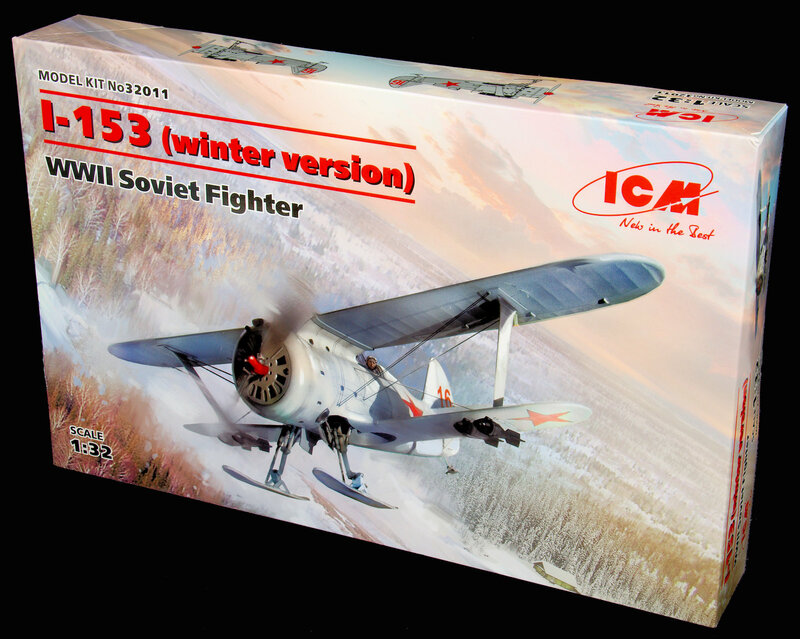 The I-153 entered Red Air Force service in October 1938, and was soon thrust into combat in the Far East, where the Soviet Union was engaged in an unofficial war against Japan in Mongolia. Thirteen aircraft had been allocated to the 22nd IAP, and on 7 July 1939 nine were sent into combat with their wheels down. 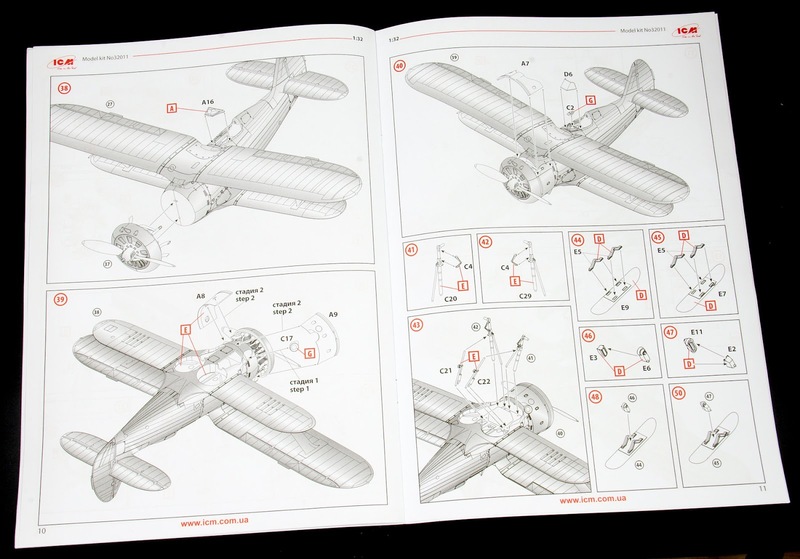 As had been hoped this convinced the pilots of a flight of Japanese Nakajima Ki-27 monoplanes that thought they were facing the I-152. 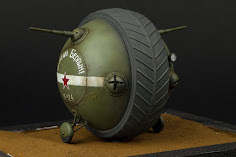 Just before they entered combat the Soviet pilots raised their undercarriages (surprise mother-lover!) and turned into combat. Four Japanese aircraft were claimed, although only two losses were acknowledged by the Japanese. After this early success, the Japanese worked out how to deal with the I-153, which despite its increased speed was still slower than the Japanese fighters. 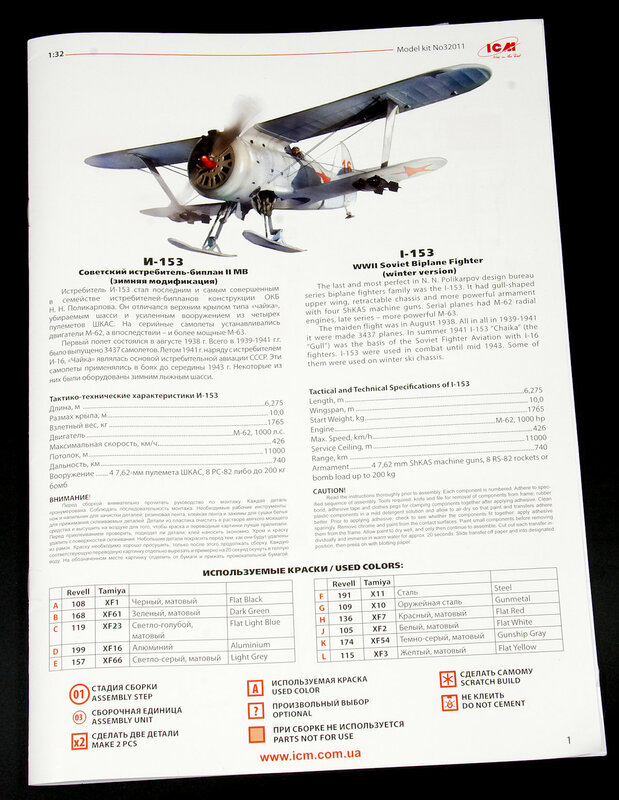 As a result, the I-153 could only be used when supported by the Polikarpov I-16 monoplane. A total of 70 I-153s were sent to this front, and 23 were lost. Ninety-three I-153s were provided to China (a tiny proportion of the overall Soviet contribution to the war effort against Japan in 1937-1941). The I-153 saw combat during the Winter War against Finland in 1939-1940, and again suffered heavy losses against the small Finnish air force. 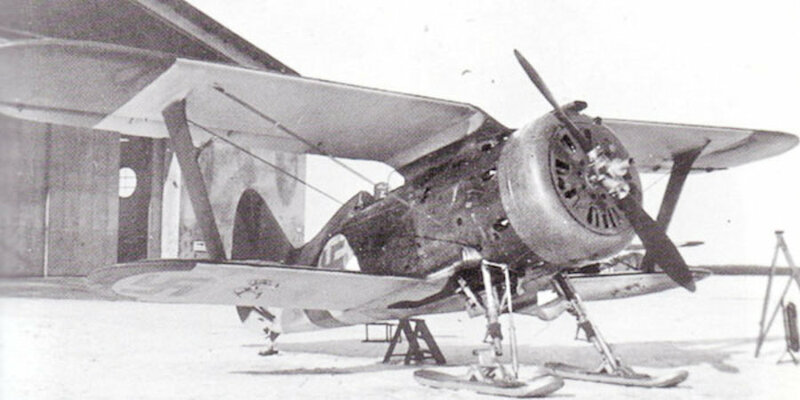 The Finnish captured many of these fighters and pressed them into service where they served until 1945. 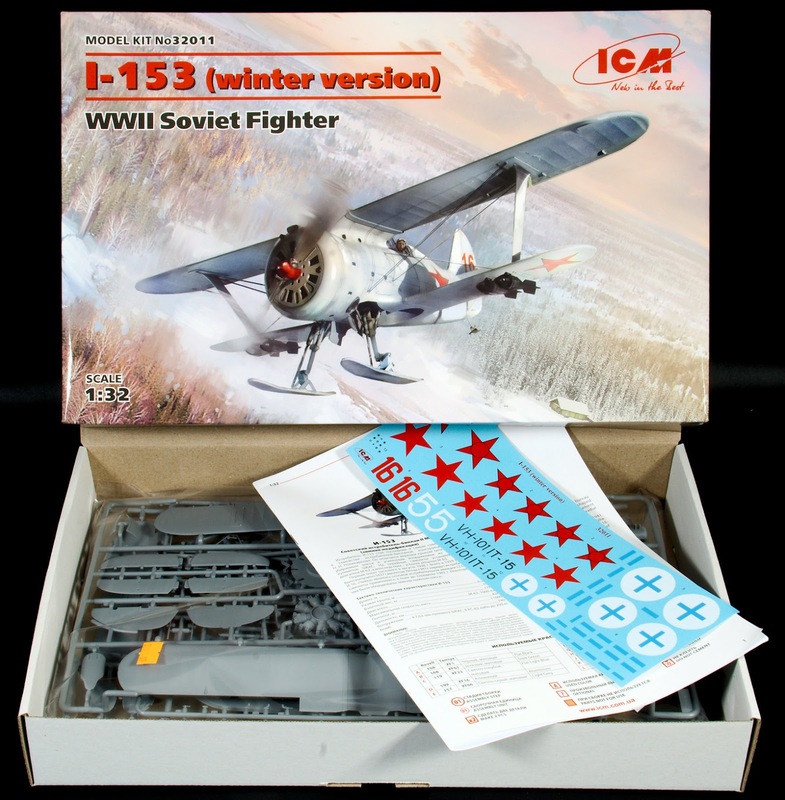 On 22 June 1941, the I-153 made up one-third of the Soviet fighter forces in the western parts of the Soviet Union, accounting for around 1,500 of the 4,226 fighters available at the start of the German invasion. 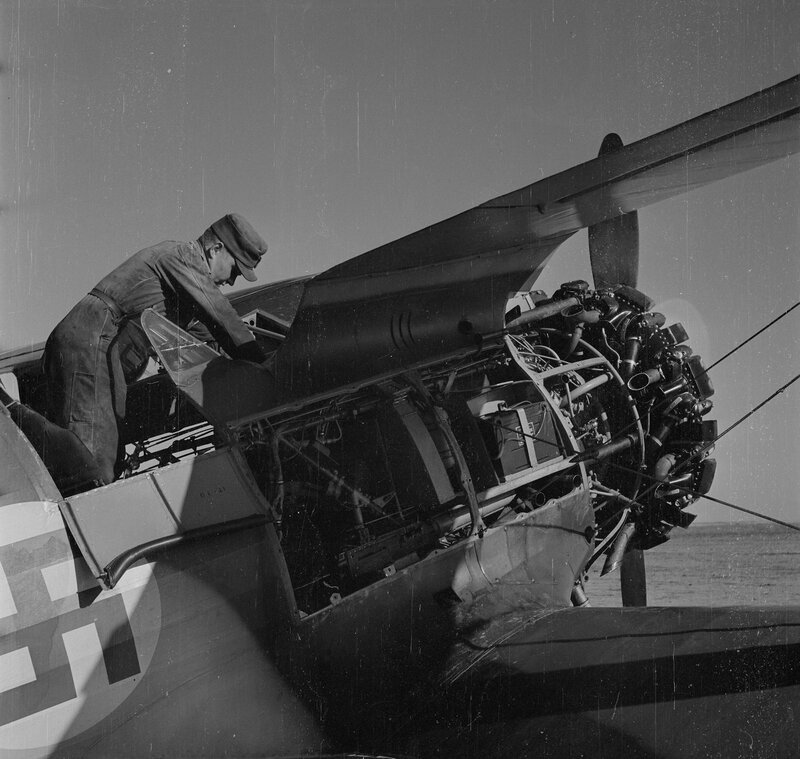 A vast number of aircraft were destroyed in the first few days of the fighting, but enough I-153s survived for them to play a major part in the early part of the fighting, and they were responsible for most of the 800 German aircraft claimed between 22 June and 5 July. 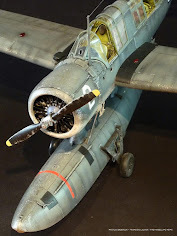 The I-153 remained in use as a front line fighter until early in 1942, but by then very few aircraft were still intact, having been lost in the air, on the ground and while acting as ground attack aircraft. 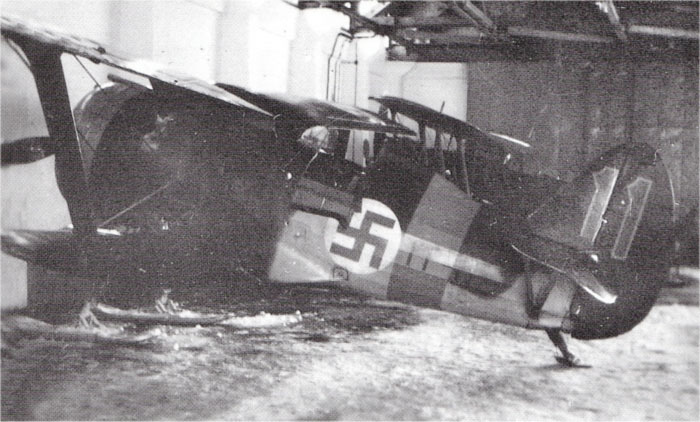 The surviving aircraft remained in use in secondary roles into 1943, although they were also used as ground attack aircraft. 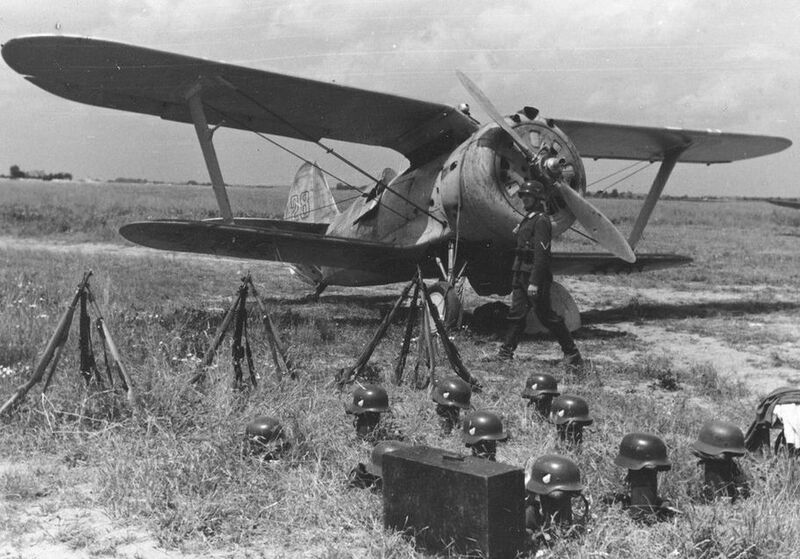 By the middle of 1943, the Red Air Force only had 36 I-153s on its strength. 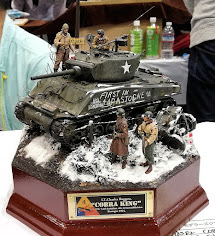 A few remained in service in the Far East as late as 1945. 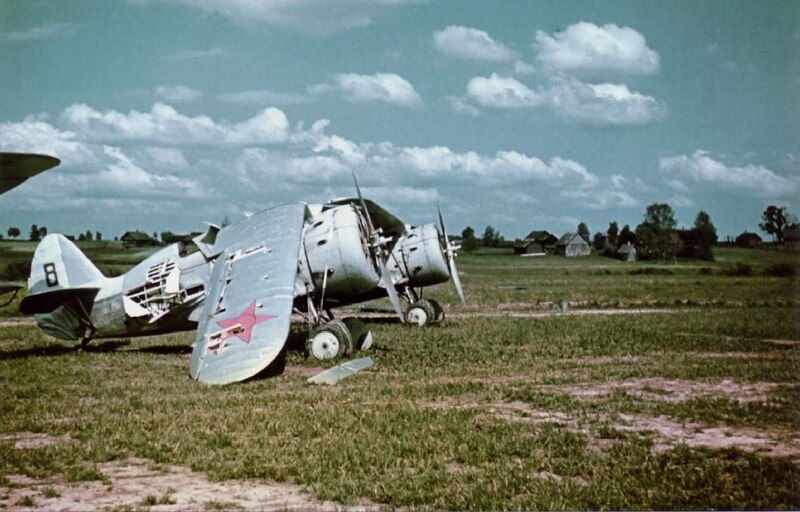 A rare colour photograph of an I-153 destroyed by the Germans as part of Operation Barbarossa. 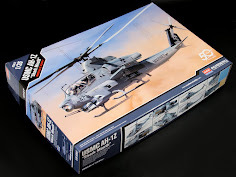 The first thing I noticed about this kit (and a few other from ICM) is the amazing artwork on the box top. Wow - the whole aspect of a white aircraft on a snowy background highlighted in red and capturing one of the more attractive angles of the fighter - it really helps sell the kit straight off the shelves. That and the cheap price point kind of cry out for that middle market that companies like Revell have seemed to dominate in the past. Kudos to the box artist on this one then. 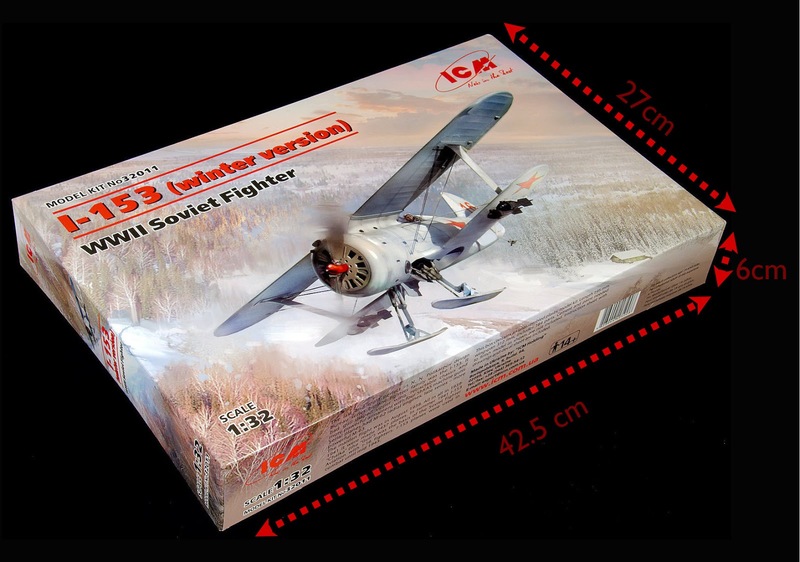 The box itself is a little smaller than most of the 32nd scale aircraft you might be accustomed to also, coming in at 42.5 cm X 6cm X 27cm which is a little easier to sneak in the house don't you think? Inside the box top is the box lid that forms that extra protective layer to keep the contents safe. 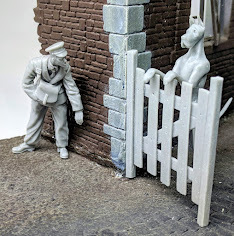 This, in-turn, opens up to reveal an instruction manual on coloured paper, inside that a decal sheet, and four sprues of light grey plastic and one small sprue for the transparencies. 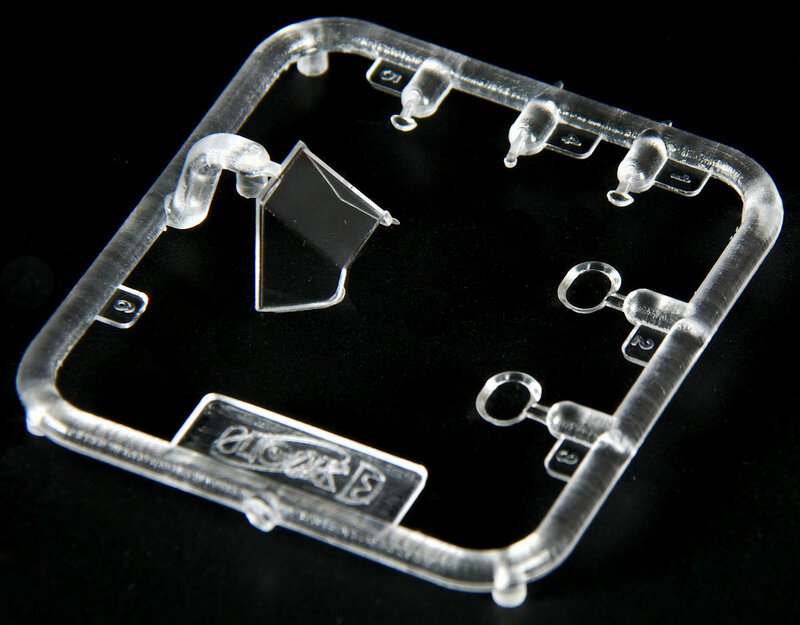 These clear parts are in their own bag, whereas the light grey sprues were undamaged, but they do travel in one clear bag. I would think the more this kit would move the more danger of a few bits scratching around in transit. My kit had no such signs of wear. 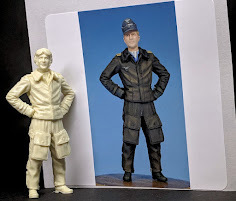 The third model of this particular aircraft from ICM, they are a real alternative to the Silverwings resin kit which is excellent - but for those shy of making a resin kit it was, up until last year was the only option. 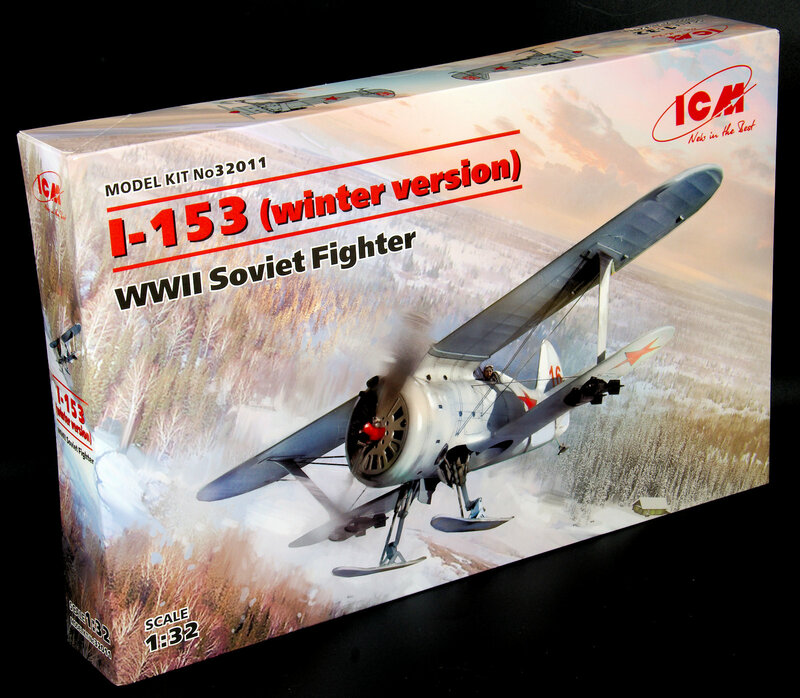 If I was an aircraft model making company of this genre I would be worried about ICM and other companies hitting the market. 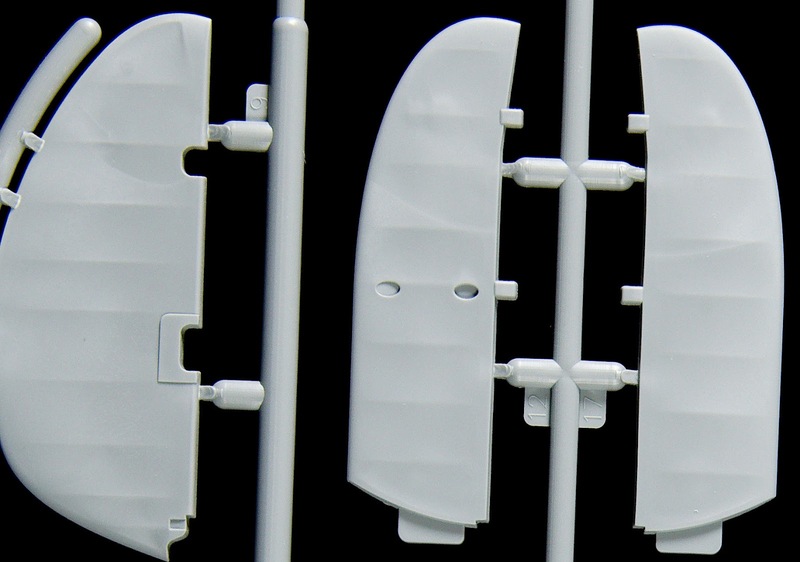 The biggest parts of the kit the barrel-shaped fuselage dominate sprue A. 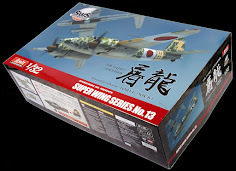 Along with the lower of the wings (both halves upper and lower,) the two-bladed propeller, two wheels in two halves that most people buying this kit probably will not use though the option is there, the cockpit floor, engine cowlings of the M-62 rotary are here also. The central part of the I-153 was a steel tetrahedral truss of the fuselage of thin-walled steel tubes. In the nose part, through the system of rubber shock absorbers, a motor-frame with an engine was attached. In the middle part of the fuselage, there are two centre sections for docking the wings. In its upper part there is a steel V-shaped truss, which is the skeleton of the “gull”, and in the lower part - a duralumin centre section, tied with chassis domes and reinforced with steel braces. The streamlined shape of the fuselage is formed by a transverse set of light duralumin profiles. In the front part, the transverse set of frames was partially reinforced by stringers, on top of the structure was closed with easily removable duralumin covers fastened with screws. The tail of the fuselage, including the cockpit. 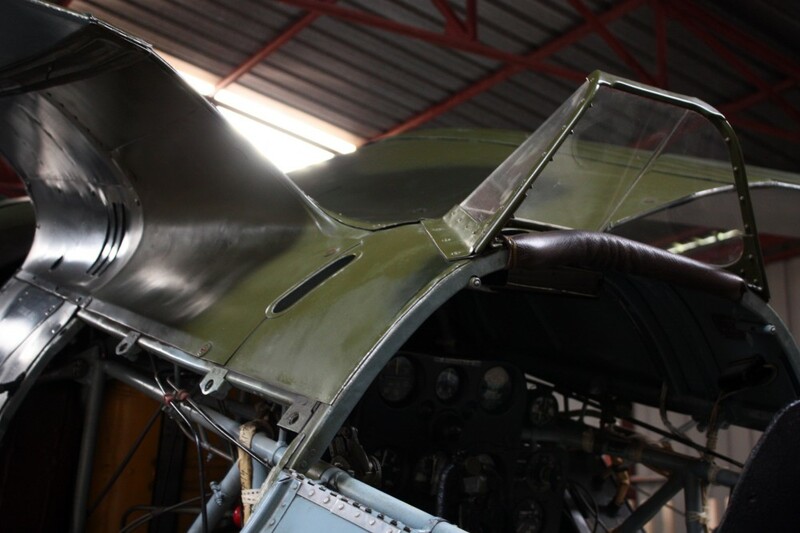 Below, we see the fuselage section with it's all metal thinly formed engine cowlings and mid panels at the front, then the wooden framed and fabric covered the rear of the aircraft shown to good effect by the surface detail made by ICM. A restored (wheeled) I-153 fuselage for comparison. The top of the lower wings in this picture. Both have a secure connection lug, and as you can see it represents the older canvas over wood wing structure of the I-153 very well. The undersides of the bottom wings. Here you see the weapon racks in place (those four squares) and these could be left on or left off. I would think if these were not being used they would be left on. So either "start splainin' " these away unless you have some references, or remove them if you do not want any weapons on your Chaika as good practice. The instrument panel is different on this kite to its sibling I-16 with a squarish panel with a rounded off top and two side panels added to that - it is in three dimensional depth, and the option to use the kit decals and fill in these bezels with clear or the like is very tempting and would prove to be an easy step in construction. A restored version below - the same shape is evident even if I am not sure of the instruments themselves. 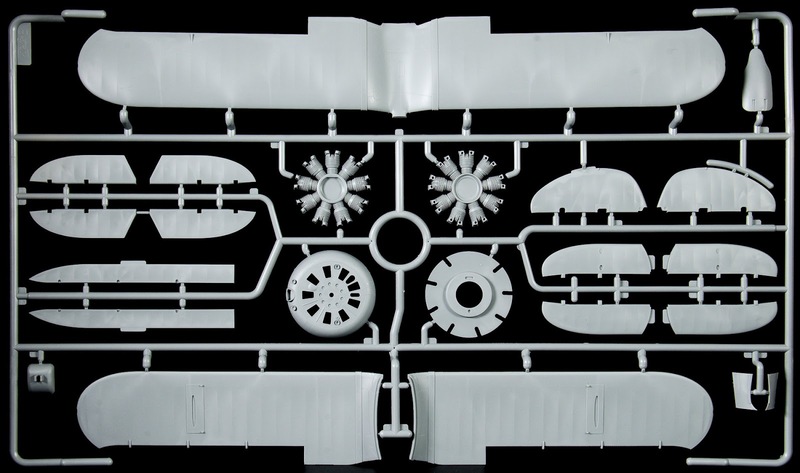 All of the major things that keep the I-153 frying are on sprue B. The large, bent top and bottom halves of the upper gull-wing, the horizontal and vertical tail surfaces, the ailerons and a large portion of the M-62 engine of the "Chaika" are here. The bent gull wing that gives the I-153 its name is seen here from the front. It is a shame there are wing leading edge connection points to remove. There are not that large, however, and some care taken will save any problems. A look from behind the gull-wing showing some of the charm of the "Seagull's" lines. The structure of these wings were rectangular in plan, with elliptical ends of duralumin. The design of the upper and lower wings is almost identical, with box-shaped spars and truss ribs assembled from slats. The inner part of the wings to stiffen reinforced steel braces. The front of the wings and reinforcement areas are sewn with 1.5 mm plywood. After covering the wings with a canvas, when applying paintwork, the front part of the wings carefully trimmed and polished. 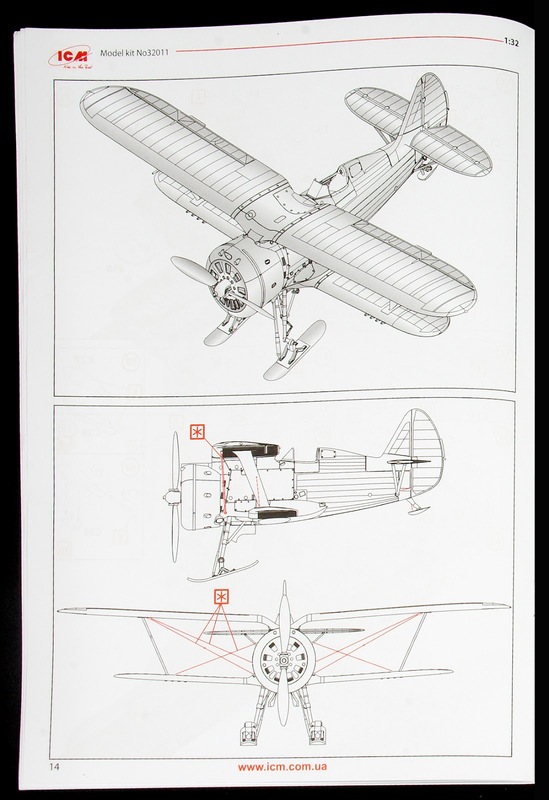 The upper wing was equipped with two-section ailerons, riveted from duralumin and sheathed in canvas. The movable flying surfaces are something that was hailed as a miracle in large scales aircraft ten years ago but now is just good practice. 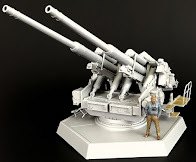 ICM is giving us what we want here, and it is nice to see the option available in this kit to pose the flying surfaces as you wish. Below is the tail view showing you the doped surfaces sagging under the wooden bracing. I think the kit makers have captured this look very well. 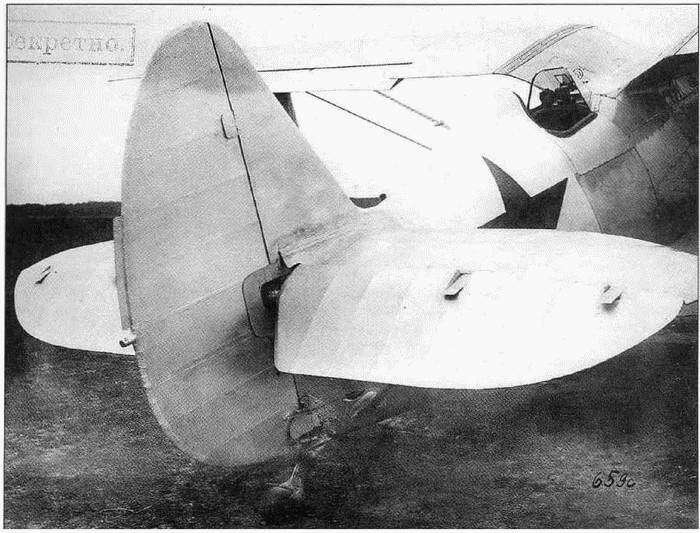 The tail had a duralumin frame, sheathed in canvas. The stabilizer, equipped with V-shaped struts drop-shaped section, had a mechanism for adjusting the installation angle on the ground. The front part of the bonnet has nine holes (one for each piston) for cooling with a total area of 2000 cm, and for adjusting the cooling of the engine, the holes were blocked by a movable flap. 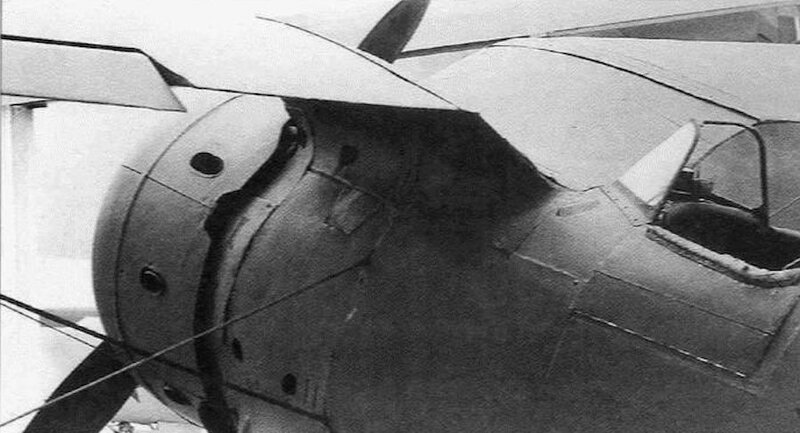 The front cowling of the I-153's engine consisted of a fixed frontal ring and three removable covers. Covers were placed on the locks, additional fixation was carried out with a tape of stainless steel, tightened with the help of the tender (this is the very silver looking ring around the nose cowling). In the picture below you see the nicely replicated front engine cowling face - a feature of this aircraft, and to me another lovely feature of the type. 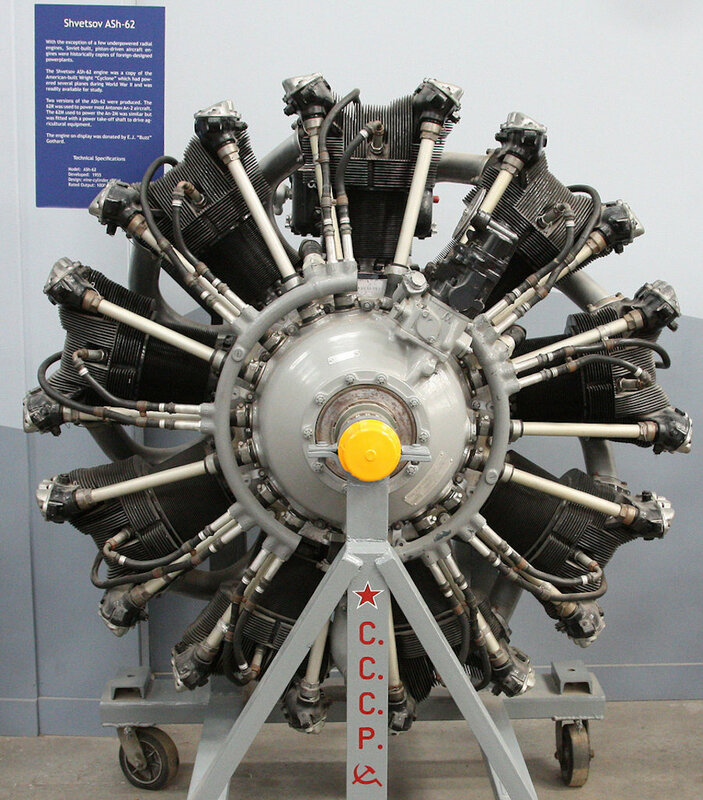 The I-153's Shestov M-62 engine had a variable pitch propeller with a diameter of 2.8 m. It was equipped with a two-speed supercharger to increase power at altitude. The engine is closed by a NACA type hood, in which there were 8 exhaust ports. On the kit, the cooling vanes of each of the nine piston housings are nicely replicated although they do join right down the centre of each, and that can lead to vertical seams across the horizontal vanes. This is a non-issue, however, as unless you want to show the engine fully exposed, the front is sealed up almost completely behind that big cowling. 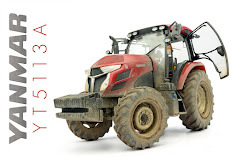 To improve the flow of air through the air-cooled engine, the space behind the engine is covered with an internal bonnet that has removable covers for access to the rear of the crankcase, oil tank and motor units. On the machines of the first series, an oil cooler passed through the inner hood with an exit on the left side of the fuselage. 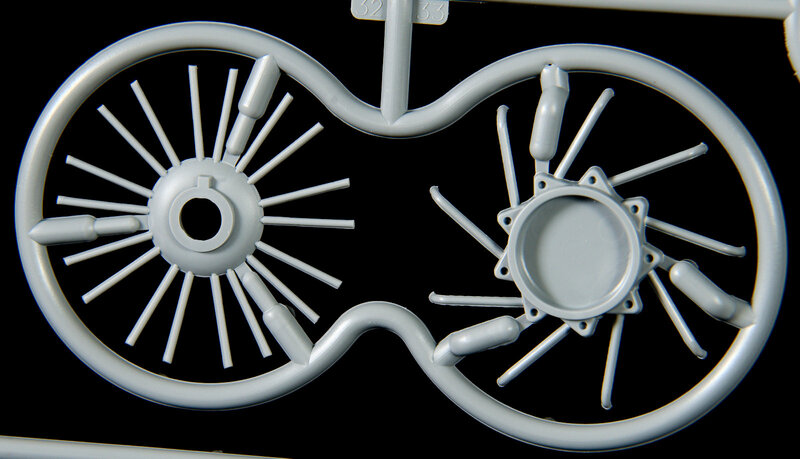 This sprue houses some of the more intricate parts of the I-153. 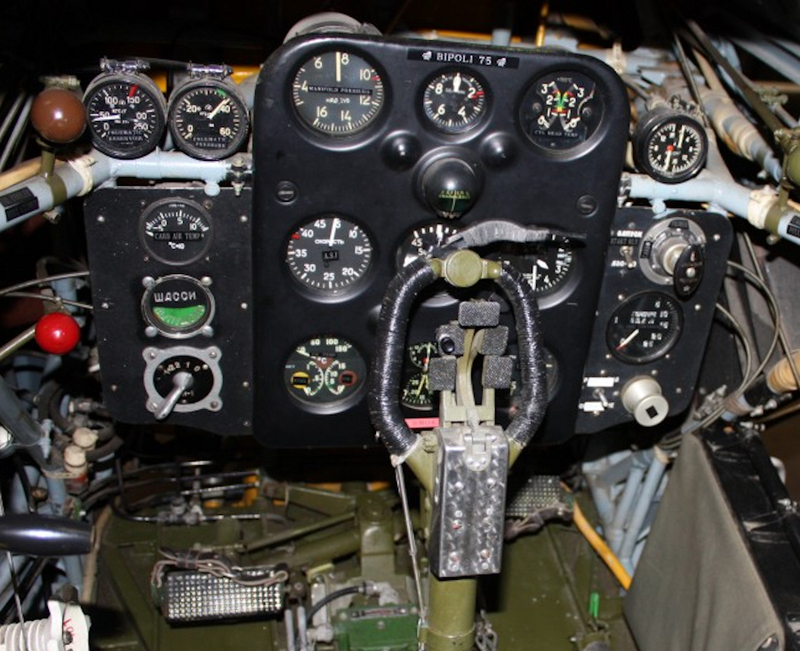 Not only are the ignition wired, piston rods, part of the side cockpit internal frame, here, but the internal fascia of the rotary engine and notably the armament in the shape of four FAB-50 bombs and four AO-25 aerial bombs. You can see here the push-rods for the M-62 engine and the exhaust manifolds - no real flash on them which is nice, and still thick enough not to break too easily. 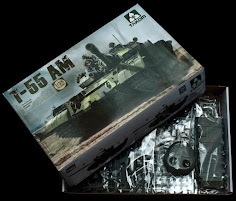 Included as external armaments are four FAB-50.bombs and four AO-25 bombs. Here these two bombs the FAB-50.bombs on the left, AO-25 on the right and they look pretty good, but maybe needs some slight shape alterations and additions. 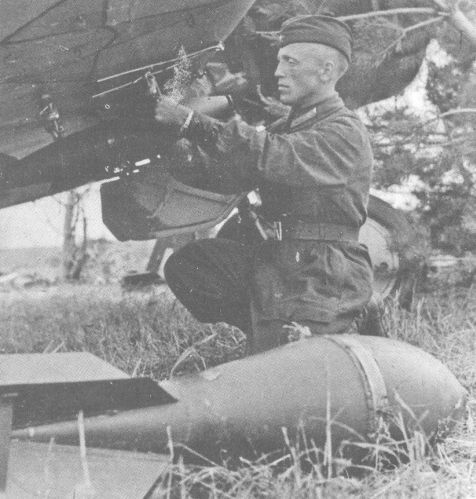 These bombs are both seen here being loaded on to an I-153 before a mission. The ski-equipped I-153 needs some skis and this small sprue has the slightly curved landing skis along with the thick-ish looking struts and gear to support them. 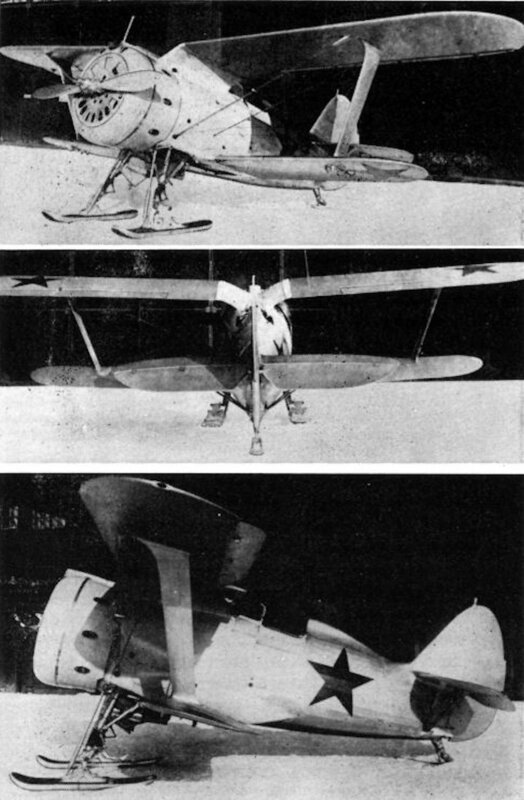 In winter, the aircraft was altered to use skis in place of the wheeled undercarriage, which, when retracted, were still exposed but pressed against the fuselage. 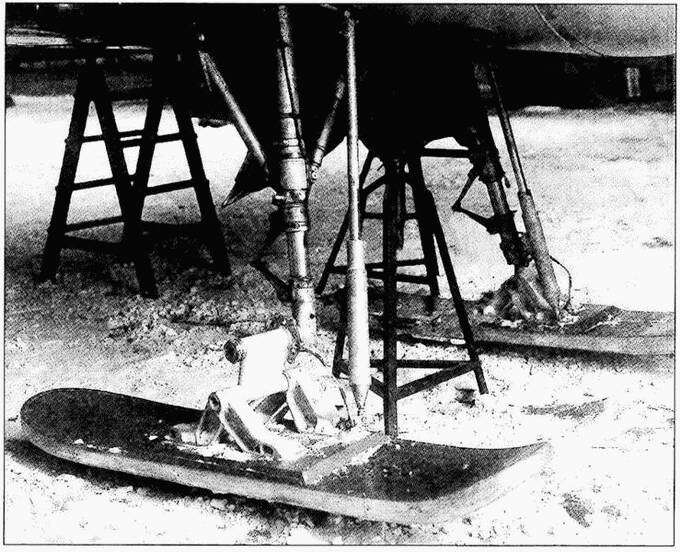 The skis from the I-16 aircraft were used, with a modification of the boar attachment and the introduction of an additional link - the so-called earring, which increased the level of the aircraft when on the ground to the required height. there are none of these "earings" in this boxing but they could be scratch built pretty easily by the modeller. 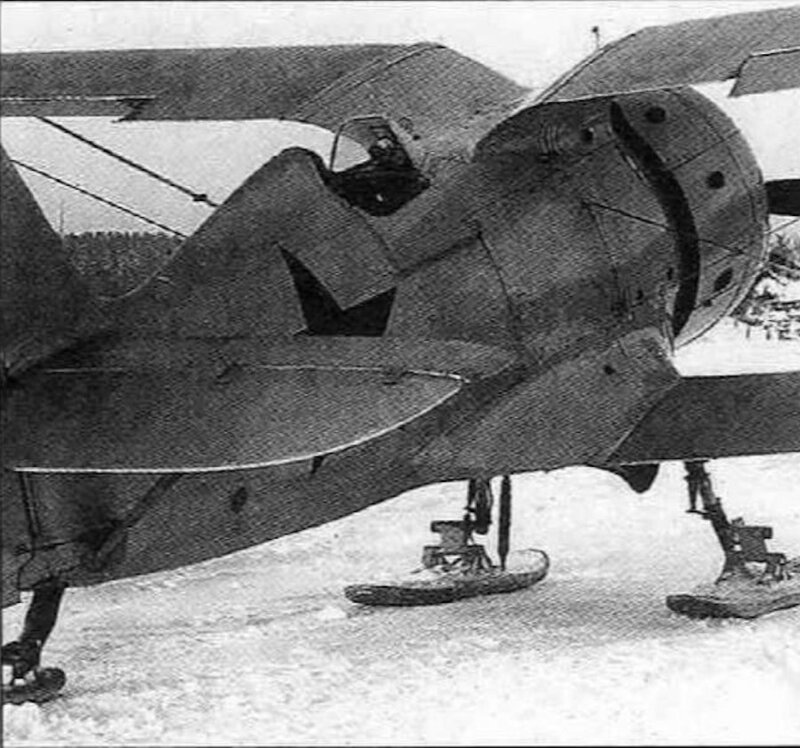 The tail wheel in winter was replaced by a small ski, popularly referred to as "skion". During the flights from a muddy airstrip, the wheeled tail often would bury in, and interfere with the taxiing. Because of this, many pilots preferred to leave the skion on the aircraft even in the summer. 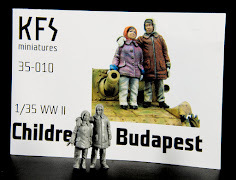 Showing you how to put all of these parts together is A4 portrait format instruction booklet. 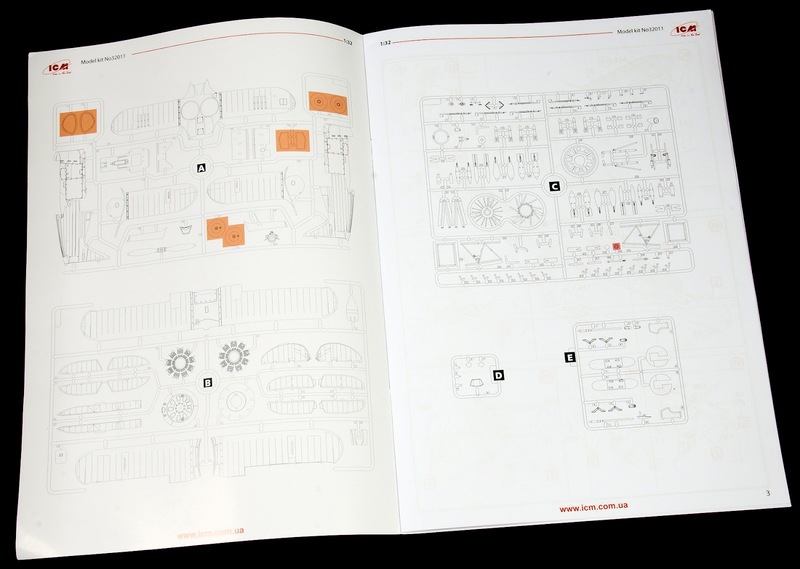 Printed out of thin glossy paper, this fourteen-page booklet has sixty steps to it - but do not worry, these are all baby steps in a way, with every sub-assembly being its own step. There is no real way to confuse what you are doing or looking at with the drawings and written text in Ukrainian and in English languages. On the first page, we have a very brief into the aircraft and the paint colour call-outs that you will use throughout the model construction in both Revell and Humbrol paints along with the basic colour name. 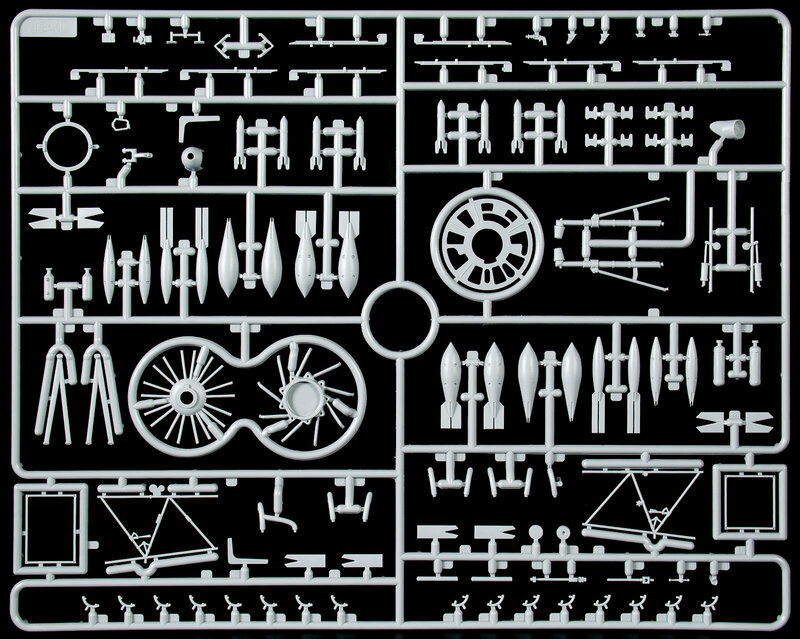 The Sprue Map: This shows us the four grey and one clear sprue being used in this kit. 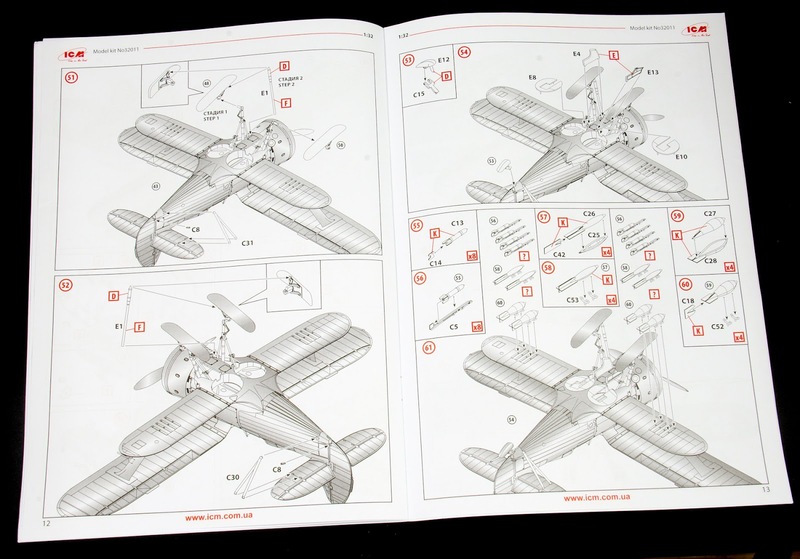 Notice the omission of certain shaded in parts like the wheels and the covers for the landing gear bay of note. For once, but only briefly, construction does NOT start a the cockpit😊 - we put together the two lower wings for the cockpit floor to sit upon, then the cockpit frame, and the internal parts of the two fuselage halves are dressed. 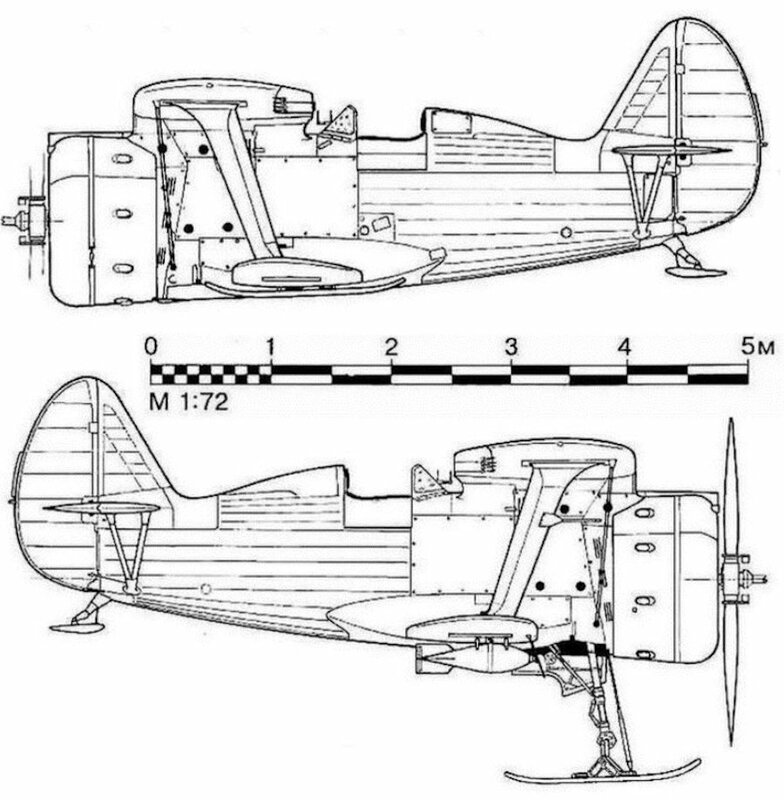 The barrel-chested fuselage then closes down the middle and then joins to the lower wing and the internal pilot's seat and cockpit frame. The posable tail surfaces are added and the top gull-wing are joined together now - this kite is already looking like a real aircraft. The ailerons are added to the top wings and the vertical tail rudder is positioned as you like before we start to make the Shestov nice cylinder rotary engine, cowling face and propeller. 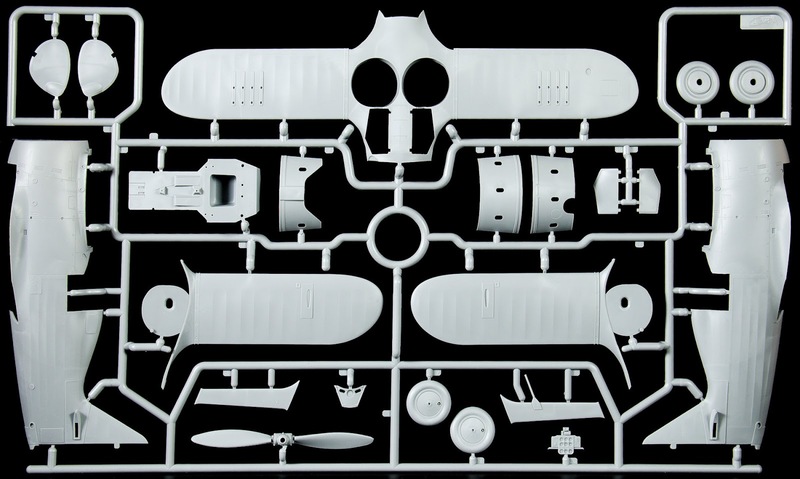 The engine is now added to the front of the aircraft, the cowling is also secured no if you are making the kit with an enclosed nose and the cockpit glazing is added. Steps 41 - 56 have you making the ski landing gear - a lot so little steps which kind of keep it simple for the modeller in evidence here. 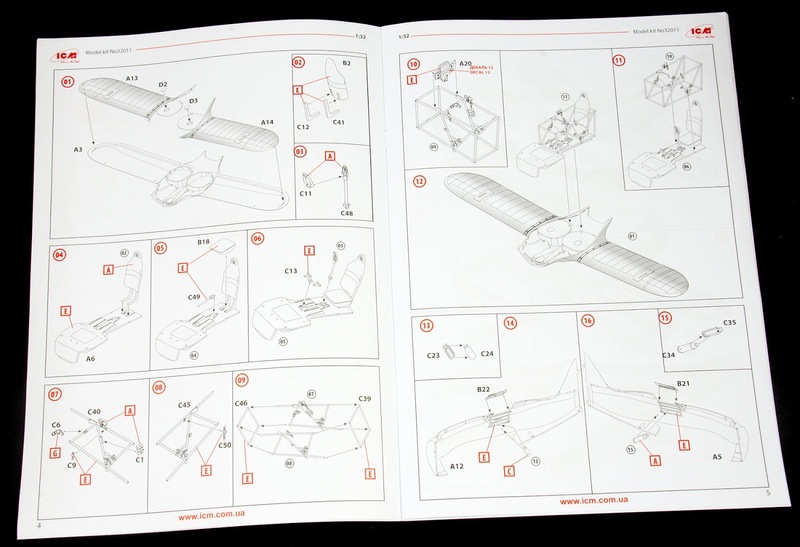 The very last part of the instruction booklet gives us pointers of where the metal struts that support the wings are attached to. 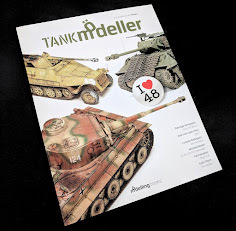 An invaluable reference for modellers and something that if not pointed out so neatly could be messed up. 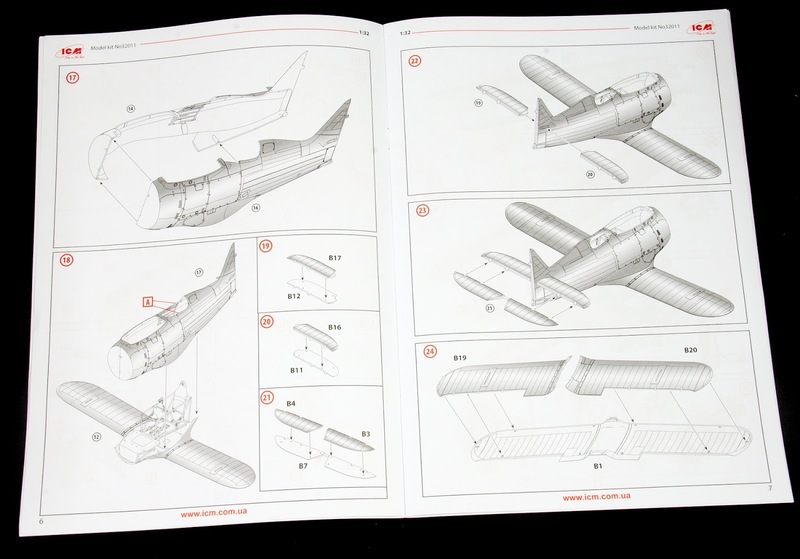 There are three marking choices of ski-equipped I-153's in this kit. 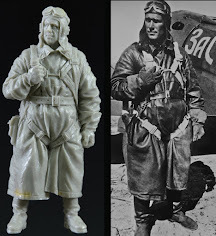 Here below is the I-153 in the standard silver dope shade and pre-war red star markings. According to some sources, st.lt.Nikolaj Perevezentshev of 38 IAP force landed on the iced-over of Gulf of Finland 20.02 1940 and was never found. The aircraft's tail number is said to be "16". So this could be a possible identification. 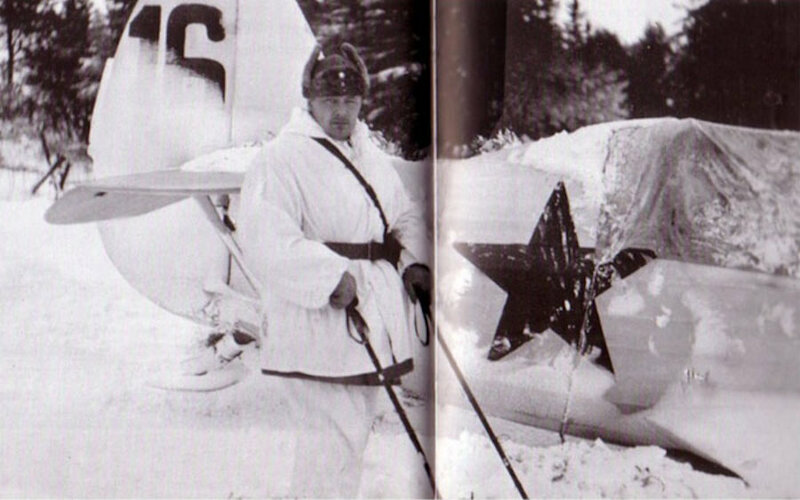 This aircraft was said to have been captured during the Winter War by Finns. 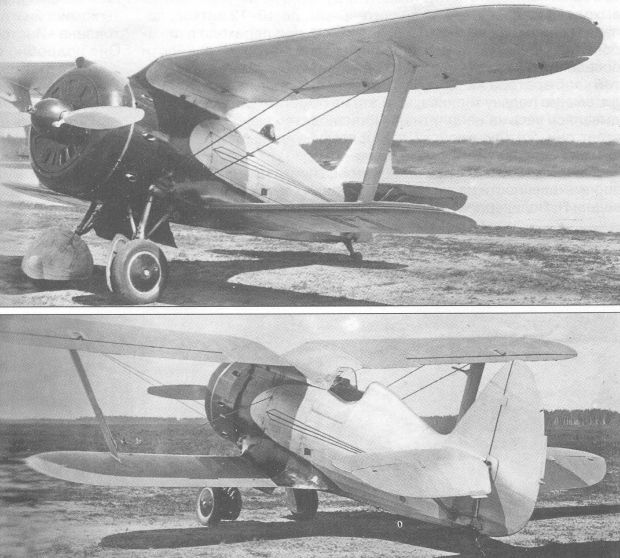 The second photo is described as the plane of N..I. 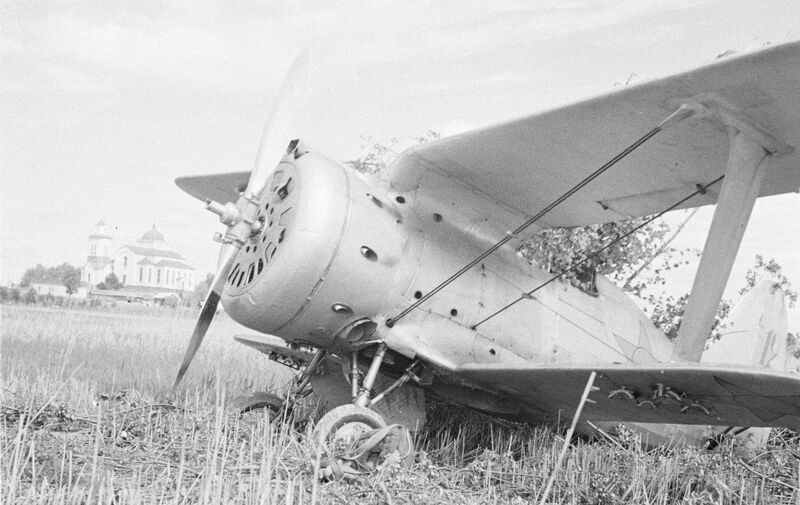 Vydashenko of 38 IAP, after a forced landing near Långo in the Gulf of Finland after several AA hits. His comrade, Lt G.L. 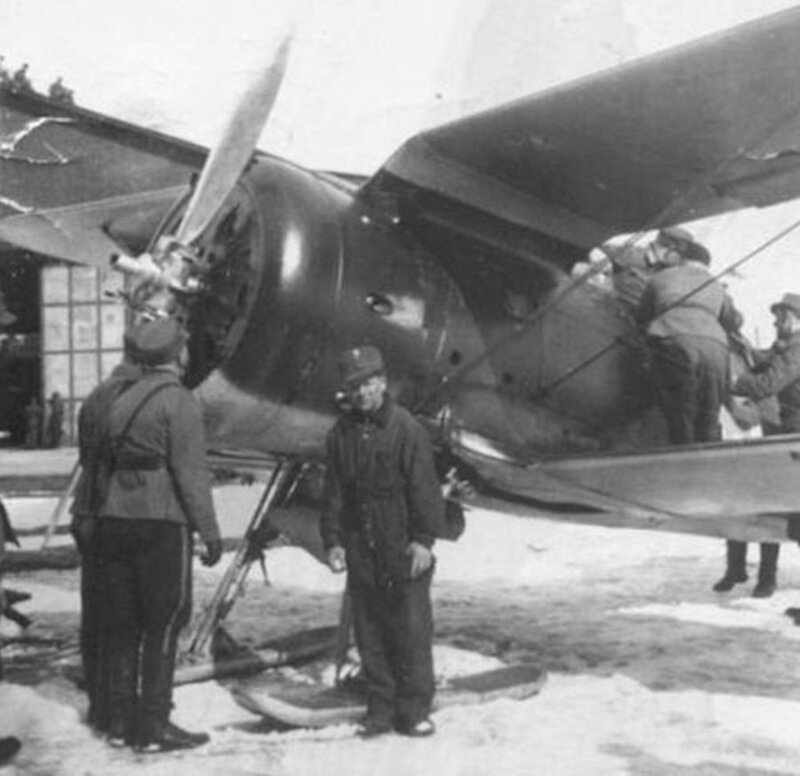 Lobach, landed next to Vydashenko's I-153 and rescued him after the plane was "set on fire", according to some reports. It turns out that "Red 16" was almost intact as can see on the photo below. The serial number was 7275, but no tail number is shown in this picture. 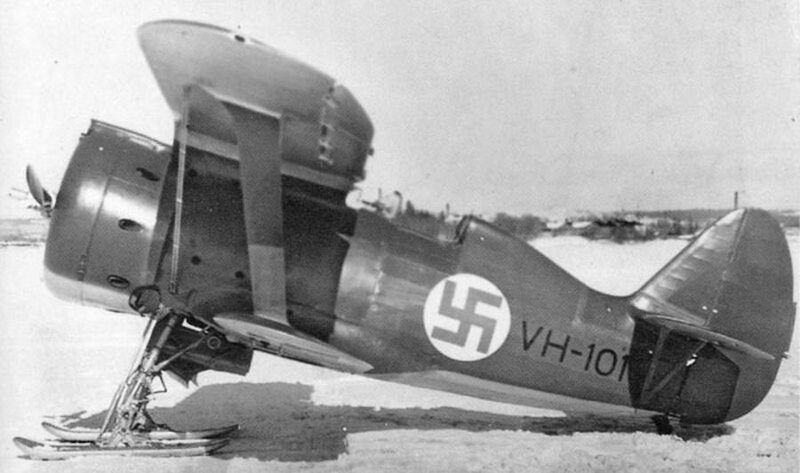 I-153 "VH-101" of the Finnish Air Force, 1940, Finished in a plain field green over light blue undersides, this was a captured and restored "Seagull" Note swastikas are shown here as the "+" symbol for censorship laws. 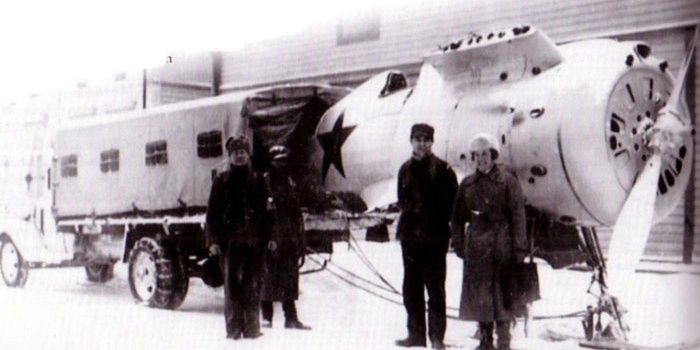 VH-101 was the first I-153 to be captured during the Winter War and to be put into Finnish service. It was assigned to LLv 14 0n 18 April 1940. Later "VH-101" was renamed VH-11 and in 1942/43. The plane was repainted with a new camouflage of green & black. The number on the tail was changed to "11" and changed in colour. The plane was also seen in summer with wheeled landing gear so this can be represented with wheels that are also supplied in the kit. 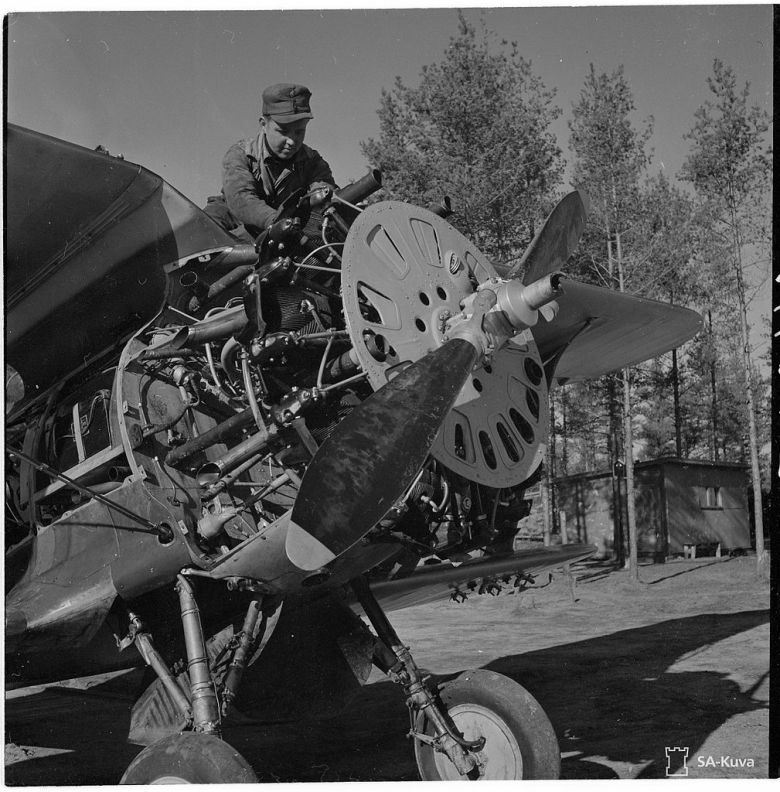 I-153 "T-15" of the Finnish Air Force, 1940. This aircraft was finished in a Field Green over flat black with an underside of light, complete with yellow identification bands on the nose and the tail. "IT-15" in winter 1941/42. Note that the yellow of the nose appears lighter than that of the fuselage and wingtip bands. This aircraft was also seen with wheels earlier in the war, so if you were keen on this version but wanted a summer setting that option would be historically relevant. 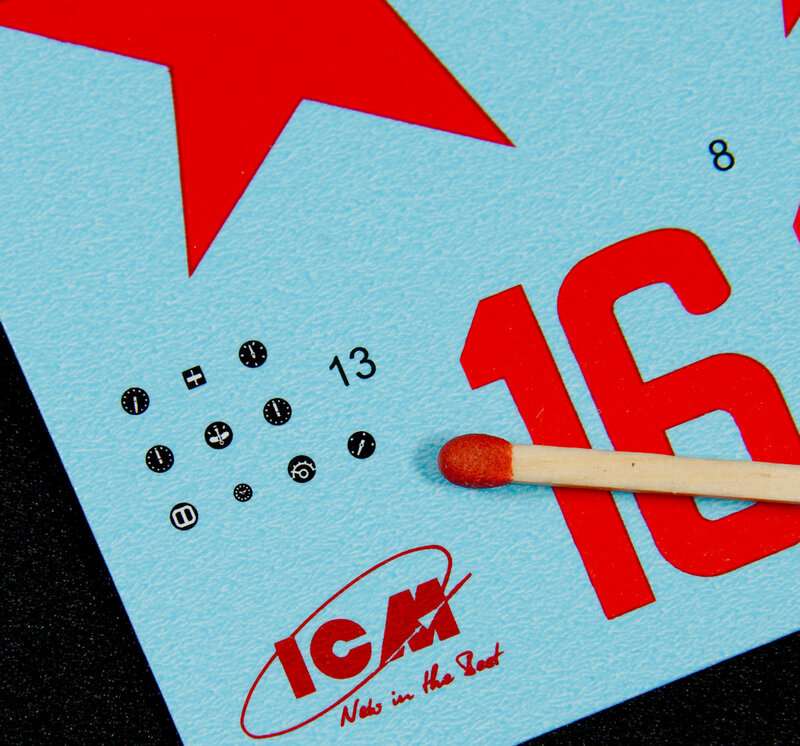 Printed by ICM in-house on one decal sheet, these are thick decals with minimal carrier film that have bright reds and a strong, non-opaque white colour. Note here the blue bars of the swastikas are added separately by the modeller to get around censorship in Japan and Germany mainly. That is the whole kit from front to back. 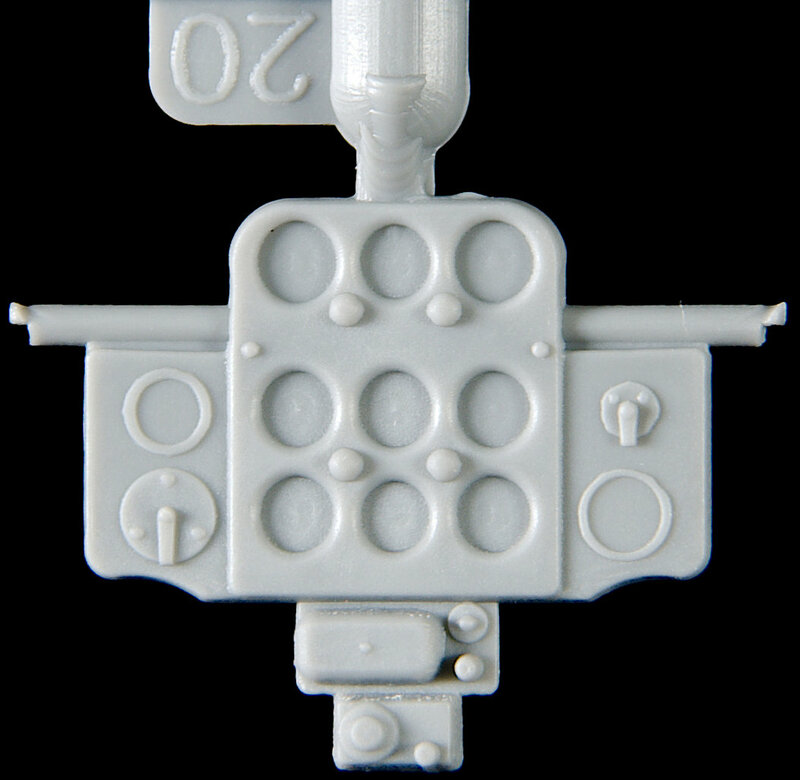 To me, if I wasn't such a busy bee I would make one or two of these at once, they are cheap, simple to make, easy to understand instructions make this a perfect kit for the casual/ non-rivet counting or beginner modeller. 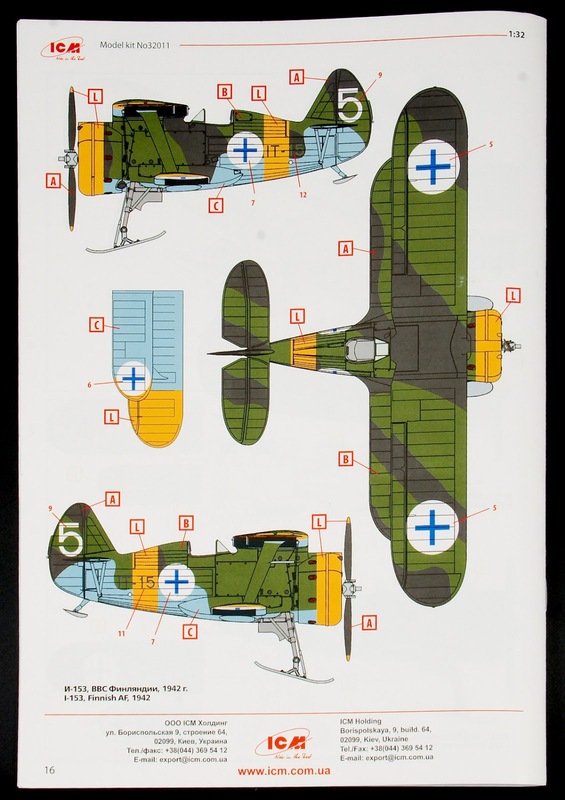 The kit is maybe a little sparse on the decal side of things, but with the creative use of masks or aftermarket there were quite a few of these aircraft made, you will be able to make your very own one easily enough. 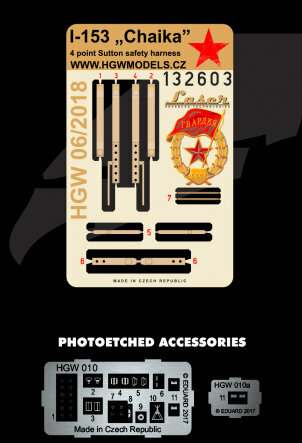 You may want to add seatbelts also - I know that HGW models make some great seatbelts for it, the only aftermarket anyone might need for this kit.